We just returned from a trip to visit my mother. That in itself is not unusual—she lives just a few hours away, and we have settled into a pattern of frequent but short visits. This trip, however, we decided to add an extra day and do some sightseeing in the North Carolina mountains, with Linville Falls as our major destination. I have some history in this area. 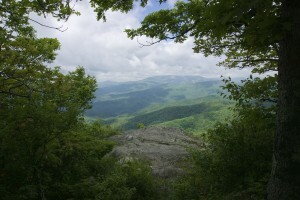 As a scout leader in my 20s, I rappelled from cliffs along the edge of the Linville Gorge Wilderness, and spent one memorable snowy night under one of those cliffs without food, shelter, sleeping bag, or heavy clothing. 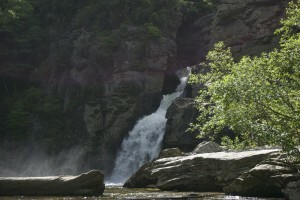 I have visited the Falls and nearby areas as a tourist off and on since childhood. As a teen with a brand new driver’s license, I would sometimes explore the unpaved and un-numbered back roads nearby. So it was fun to be back in the area and to show some of it to Nancy. Our decision as to which trail to take to view the Falls was simple: Avoid the yap dog pulling its owner along the easy trail. We took the “strenuous” route, all the way down to the plunge pool. Quite a thrill for Nancy and her two bionic hip joints. A year ago, she was nearly wheelchair-bound. We saw a glorious sunset from the grounds of our B&B, had a memorable breakfast next morning, then drove to Blowing Rock. Our great good fortune was to arrive when the rhododendron blooms were at their most glorious. 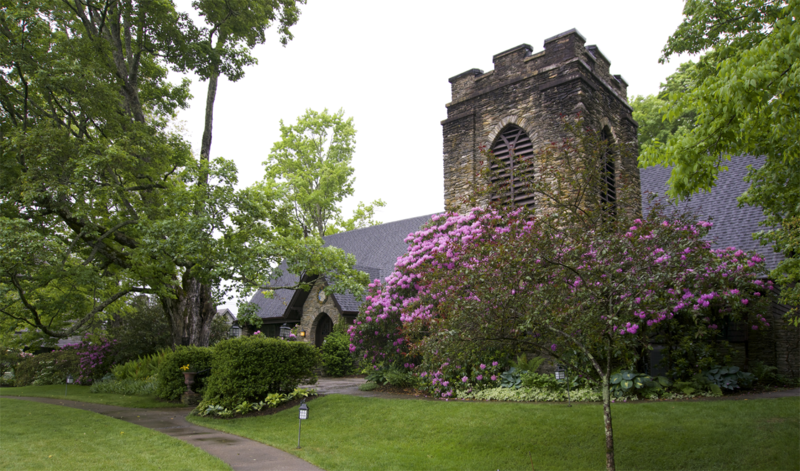 Gardens throughout the village were exquisite, especially those at the Episcopal church and the city park. We took in the vistas from The Blowing Rock itself, then drove on to my mother’s, passing two commercial structures I had helped build during my teen summers as a construction laborer. If our short mountain sojourn was a homecoming of sorts, the visit with Mother was also a homecoming of a different kind. It is common to see relatives or her friends on these visits. But I have lived elsewhere for half a century and my connection with my hometown is slight. On this trip, however, the small-town-ness of my hometown was everywhere. And I mean that in the most positive sense. Running into my former Sunday School teacher, seeing cards created for Mother by my former math teacher, shopping at the local hardware now under the helm of the founder’s great-granddaughter, taking a walk in the neighborhood over fields owned by people I have known since childhood— I felt connections everywhere. The small town sense of everyone knowing everyone came home especially with a visit to a business with which my parents have dealt practically all my life. Despite their long-term relationship, I had never had occasion to know, meet, or talk with the proprietor until a year ago. That memorable phone call began, after I had introduced myself, with the exclamation, “Brent! I am so glad you are not dead!” It seems that someone else with my name had appeared in the local obituaries a few weeks earlier. She had recognized the name and also that the list of relatives did not match. On finally meeting her this trip, she pulled out her notes of our earlier conversation, including the fact that she and Nancy were both among the first adopters of Macintosh computers. And talked and talked. About people I knew and others I probably should have known. About business dealings with my parents going back four decades. It was a true Mayberry moment. I wish I had more Mayberry moments. I, too, live in a small town. Oak Ridge is not a typical Southern rural small town, but a small town all the same, with a parochialism all its own. Were I more gregarious, I could have those Mayberry moments here. Those mountain communities I have breezed through all my life are each their own Mayberry. But I have never lingered. I suppose a Mayberry can develop anywhere we let it: a college dorm, a suburban cul-de-sac, a downtown loft. At any rate, I am glad for last week’s brief return to Mayberry.